Download "eservices Self Service Help for Students"
5 Enroll Using the Enrollment Shopping Cart The Enrollment Shopping Cart (formerly Wish List) is a tool that provides you the opportunity to save classes for use when you are ready and able (when the enrollment period opens) to enroll. In other words, it is a great tool for selecting classes and validating them before the enrollment period begins so you can be sure you re ready when the enrollment period opens. Selecting and validating your classes before you attempt to enroll will allow you to address any issues (needed prerequisites, time conflicts, etc.) that may come up related to your enrollment. If you attempt to enroll before the enrollment period begins for a particular term, you will get a message stating, You do not have a valid enrollment appointment at this time. Otherwise, when the enrollment period begins, you ll be able to enroll very quickly using this feature! Once logged in to eservices, in the Student Center under the Academics heading: 1. Click Enrollment Shopping Cart 2. Select a term and then click CONTINUE 3. Enter a Class Number and click Add to List OR 4. Find Classes a. Select Class Search or My Planner (My Requirements is not being used at this time.) Entering a specific Course Subject and Number will show sections of a specific course, such as BIOL110. Entering just Course Subject will display all courses with that Course Subject, such as all courses with the BIOL prefix. b. Selecting My Planner and clicking on the Search button will list all classes in the Planner. If you have no courses in My Planner, you will receive a message telling you The Search from My Planner feature is not available at this time. You will need to add classes to My Planner before doing this. i. Click on the Select button next to the course you want to enroll in. ii. A list of courses for the subject you selected will be displayed. iii. Once you have selected the section you want click on the Select button. iv. Click Next v. Continue using the instructions for Validate 5. Click Select Class 6. Click Next 7. 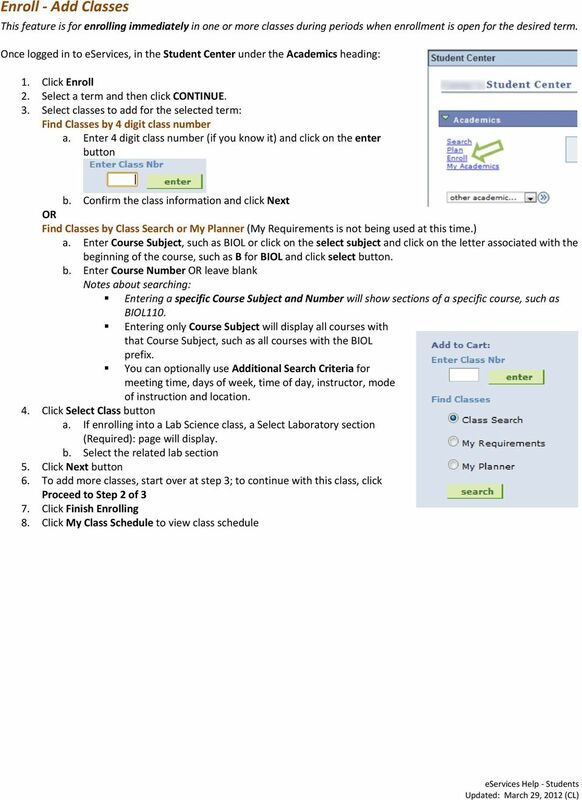 Continue with entering a class number or class search until all classes have been entered. 8. Validate your classes Use this functionality to check for prerequisites, conflicts or other problems with the shopping cart schedule. If no conflicts are displayed, you will see: OK to Add. (If there are conflicts there will be a detailed message as to the conflict.) Click on Shopping Cart button If there is a conflict of any type, the course that has the conflict can be deleted by doing the following: a. Put a check mark next to the class that is in conflict b. Click delete. (You can elect to leave the class and take care of any conflicts such as a prerequisite not being met, etc.) 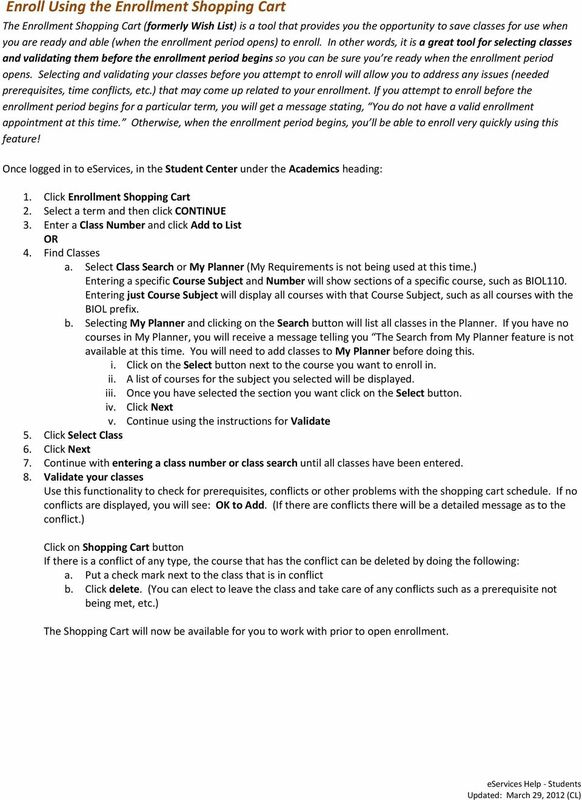 The Shopping Cart will now be available for you to work with prior to open enrollment. 6 Drop Classes Once logged in to eservices, in the Student Center under the Academics heading: 1. Click Enroll. 2. Select a term and then click CONTINUE. 3. Click on drop tab 4. Check Select column for class to be dropped 5. Click Drop Selected Classes 6. Click Finish Dropping 7. Click My Class Schedule to confirm class has been dropped (Note: If the class was dropped prior to start date, then the class will not be displayed on the class schedule. If the class was dropped during the semester, the class schedule will display the class with a status of withdrawn.) 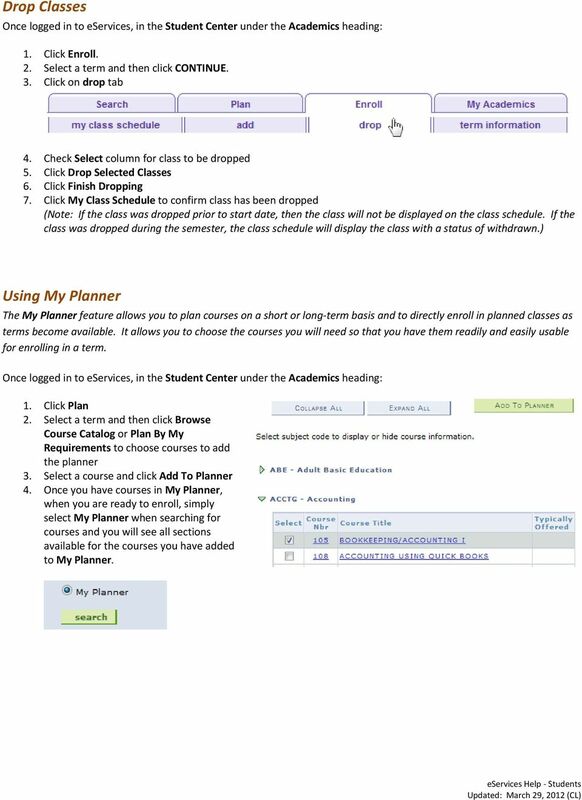 Using My Planner The My Planner feature allows you to plan courses on a short or long term basis and to directly enroll in planned classes as terms become available. It allows you to choose the courses you will need so that you have them readily and easily usable for enrolling in a term. Once logged in to eservices, in the Student Center under the Academics heading: 1. Click Plan 2. 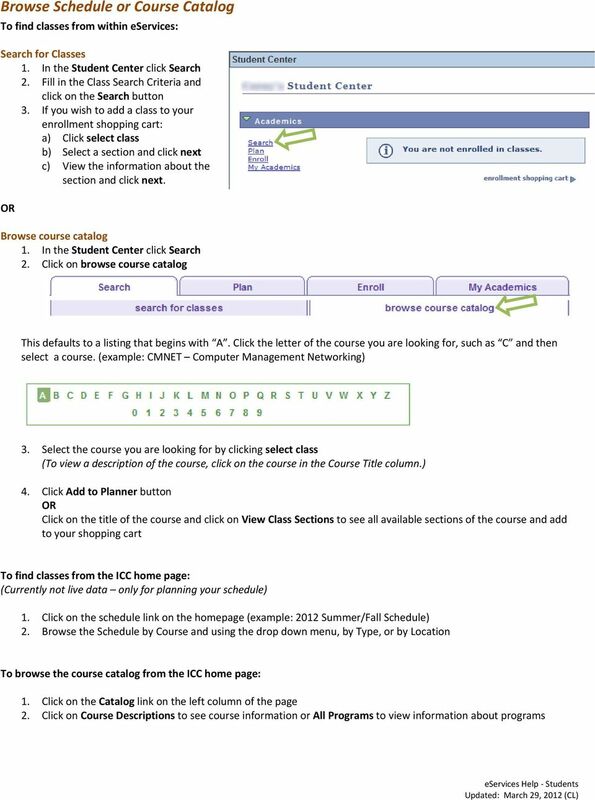 Select a term and then click Browse Course Catalog or Plan By My Requirements to choose courses to add the planner 3. Select a course and click Add To Planner 4. Once you have courses in My Planner, when you are ready to enroll, simply select My Planner when searching for courses and you will see all sections available for the courses you have added to My Planner. 7 View My Class Schedule In eservices, in the Student Center under the Academics heading: 1. Click the other academic dropdown list 2. Select Class Schedule and click the submit button This will give you a detailed view of class schedule with class number, date and time in List View or Weekly Calendar View (NOTE: List View displays only class building name and not class room number. Go to Weekly Calendar View to see building name and class room number. This view also shows any Online Classes. To see All classes in the Weekly Schedule view change Start Time to 12:00am and End Time to 11:59pm.) Find Refund and Withdrawal Dates 1. In the Student Center click on Deadlines icon ( ) in the first column of the class schedule OR 1. 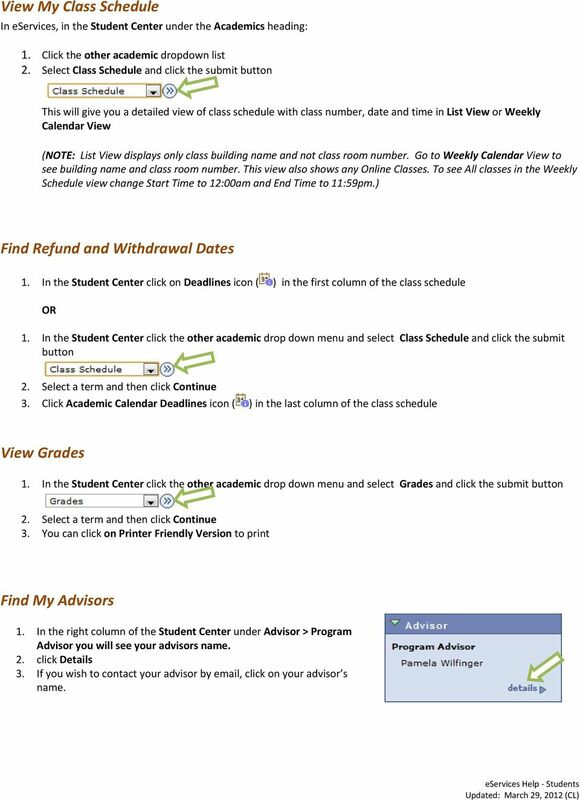 In the Student Center click the other academic drop down menu and select Class Schedule and click the submit button 2. Select a term and then click Continue 3. Click Academic Calendar Deadlines icon ( ) in the last column of the class schedule View Grades 1. In the Student Center click the other academic drop down menu and select Grades and click the submit button 2. Select a term and then click Continue 3. You can click on Printer Friendly Version to print Find My Advisors 1. In the right column of the Student Center under Advisor > Program Advisor you will see your advisors name. 2. click Details 3. If you wish to contact your advisor by , click on your advisor s name. 8 View Transcript/Transfer Credit To view/obtain your Unofficial Transcript: In the Student Center, under Academics: 1. Click on My Academics 2. Click on View my unofficial transcript 3. Select Report Type of ICC Unofficial Transcript from drop down menu 4. Select ICC Unofficial Transcript in the Report Type field and click go (**this process may take a few minutes to complete. please do not press any other buttons or links while processing is taking place**) 5. Print your unofficial transcript if desired To view your Transfer Credit: In the Student Center, under Academics: 1. Click on My Academics 2. Click on View my transfer credit report Finances Account Inquiry 1. In the Student Center under the Finances heading click on Account Inquiry. 2. 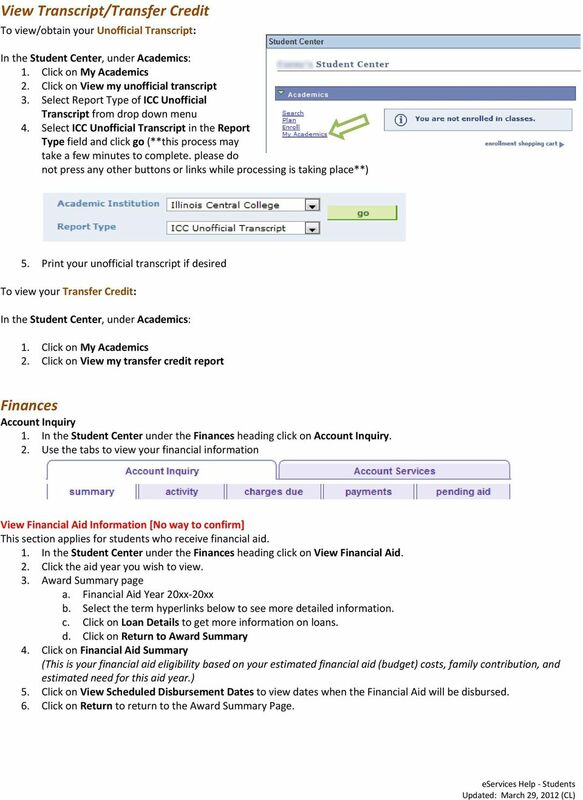 Use the tabs to view your financial information View Financial Aid Information [No way to confirm] This section applies for students who receive financial aid. 1. In the Student Center under the Finances heading click on View Financial Aid. 2. Click the aid year you wish to view. 3. Award Summary page a. Financial Aid Year 20xx 20xx b. Select the term hyperlinks below to see more detailed information. c. Click on Loan Details to get more information on loans. d. Click on Return to Award Summary 4. Click on Financial Aid Summary (This is your financial aid eligibility based on your estimated financial aid (budget) costs, family contribution, and estimated need for this aid year.) 5. Click on View Scheduled Disbursement Dates to view dates when the Financial Aid will be disbursed. 6. Click on Return to return to the Award Summary Page. 9 Update Personal Information In the Student Center under Personal Information, use the tabs to view or change information about you in eservices. 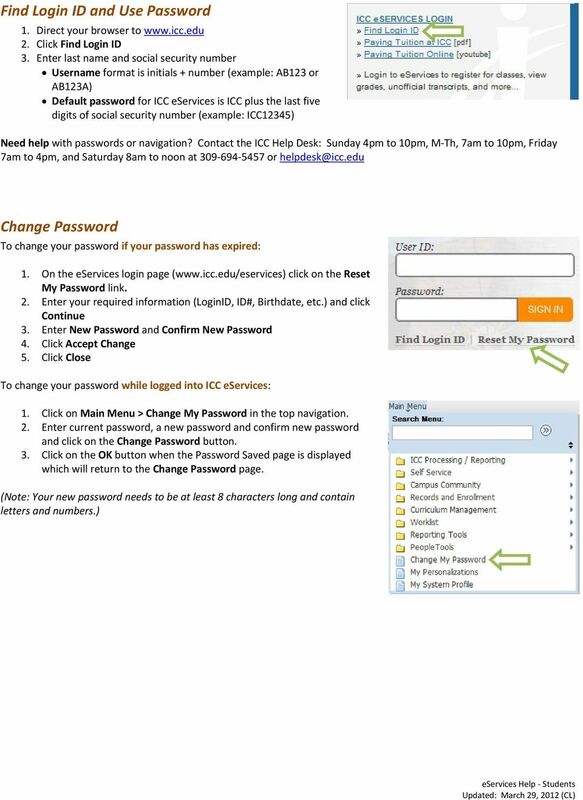 View Student ID You can obtain your student id number from the Demographic Data tab. (See next steps ) View Demographic Data 1. 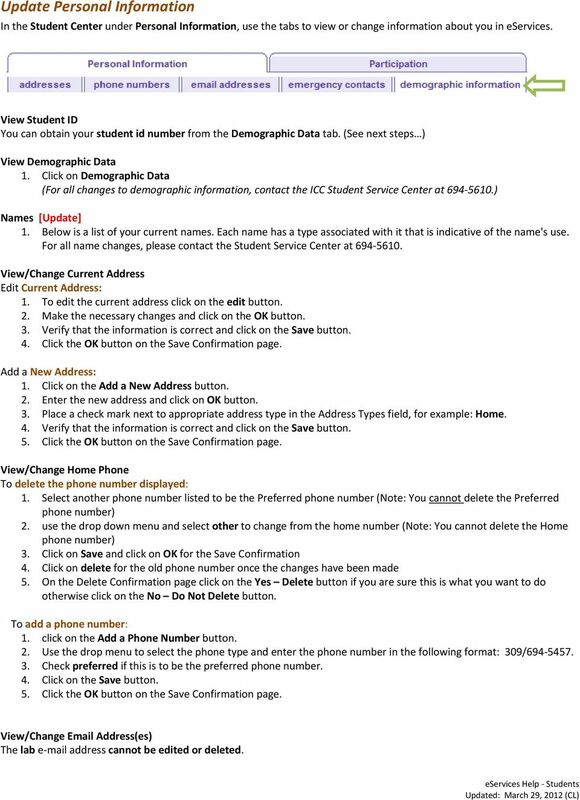 Click on Demographic Data (For all changes to demographic information, contact the ICC Student Service Center at ) Names [Update] 1. Below is a list of your current names. Each name has a type associated with it that is indicative of the name's use. For all name changes, please contact the Student Service Center at View/Change Current Address Edit Current Address: 1. To edit the current address click on the edit button. 2. Make the necessary changes and click on the OK button. 3. Verify that the information is correct and click on the Save button. 4. Click the OK button on the Save Confirmation page. Add a New Address: 1. Click on the Add a New Address button. 2. Enter the new address and click on OK button. 3. Place a check mark next to appropriate address type in the Address Types field, for example: Home. 4. Verify that the information is correct and click on the Save button. 5. Click the OK button on the Save Confirmation page. View/Change Home Phone To delete the phone number displayed: 1. Select another phone number listed to be the Preferred phone number (Note: You cannot delete the Preferred phone number) 2. use the drop down menu and select other to change from the home number (Note: You cannot delete the Home phone number) 3. Click on Save and click on OK for the Save Confirmation 4. Click on delete for the old phone number once the changes have been made 5. On the Delete Confirmation page click on the Yes Delete button if you are sure this is what you want to do otherwise click on the No Do Not Delete button. To add a phone number: 1. click on the Add a Phone Number button. 2. Use the drop menu to select the phone type and enter the phone number in the following format: 309/ Check preferred if this is to be the preferred phone number. 4. Click on the Save button. 5. Click the OK button on the Save Confirmation page. View/Change Address(es) The lab e mail address cannot be edited or deleted. 10 To add an e mail address: 1. Click on the Add an Address button 2. Use the drop down menu and select one of the following types: business, home or other and add the address for the type selected. 3. Click on the Save button. 4. Click the OK button on the Save Confirmation page. 5. To delete the e mail type of business, home and/or other click on the delete button. 6. Confirm whether or not you want to actually delete this address View/Change Emergency Contacts To add an Emergency Contact: 1. click on the Add an Emergency Contact button 2. 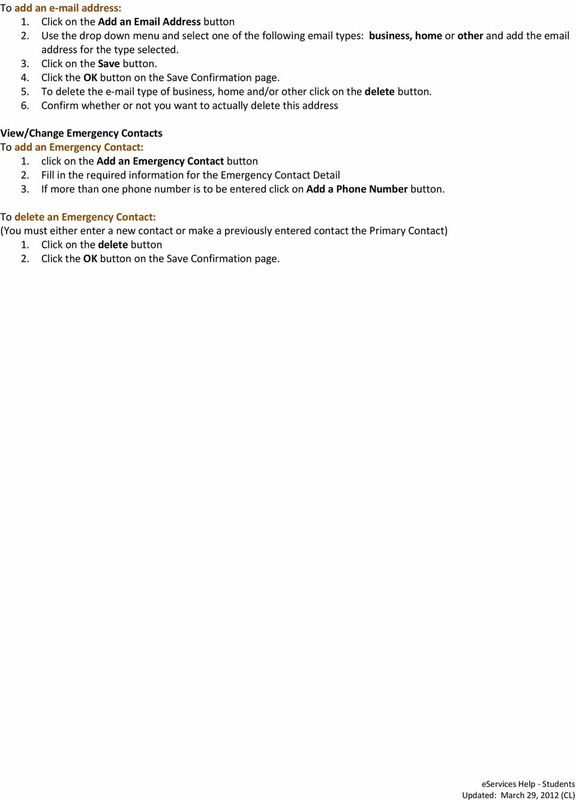 Fill in the required information for the Emergency Contact Detail 3. If more than one phone number is to be entered click on Add a Phone Number button. To delete an Emergency Contact: (You must either enter a new contact or make a previously entered contact the Primary Contact) 1. Click on the delete button 2. Click the OK button on the Save Confirmation page. Welcome to Self Service for Students! Thank you for visiting the Online Course Proposal Web Tutorial for new and existing courses for Brown University Faculty and Staff. 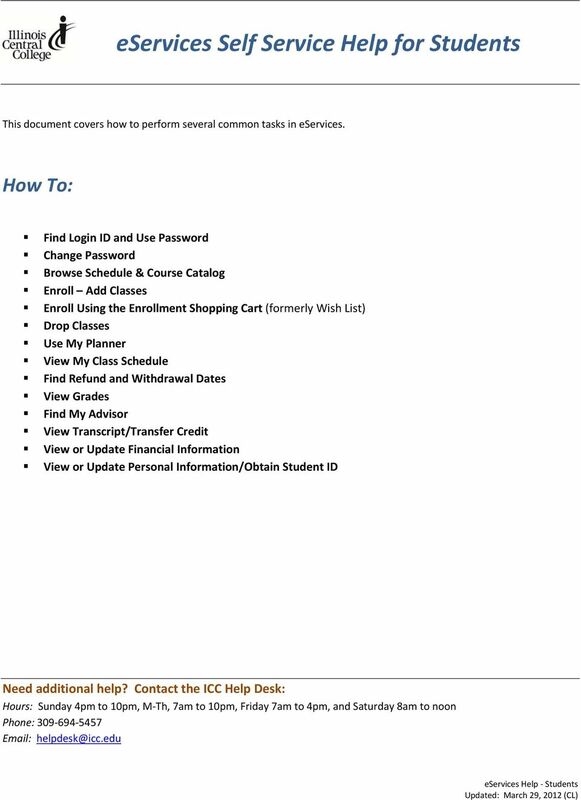 UC Santa Cruz - Office of the Registrar Academic Information Systems User Information: Academic Advisement Report The Academic Advisement Report provides degree audit information for students and advisers. Student Guide Student Information System www.case.edu/projects/erp/sis The Student Information System (SIS) provides a secure, flexible, web-based environment for creating and managing academic records. Evergreen Public Schools Staff Development Catalog & Registration Site GoSignMeUp Please ensure you are using a modern web browser: IE 11, Google Chrome, or Mozilla Firefox. How Do I Register for a Course? WILLISTON STATE COLLEGE STUDENT REGISTRATION GUIDE. Where the people make [the difference]. Student Registration Guide Wilmington Campus 411 N Front St Wilmington, NC 28401 CAPE FEAR COMMUNITY COLLEGE View or print a complete schedule of classes at www.cfcc.edu North Campus 4500 Blue Clay Rd. Welcome to the NetClassroom Cheat Sheet! Quick Start Guide Students must wait until the first day of the semester to gain access to their online and hybrid course(s).